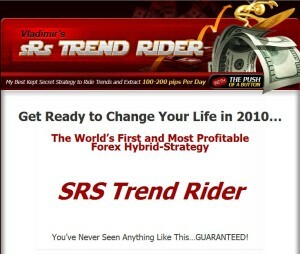 sRs Trend Rider is a unique Forex trading system. It’s a hybrid system, which means there are both, manual and automated components. The description of sRs Trend Rider says it’s 95% automated. We should understand that this system is based on a trading strategy that allows automation but also requires humanly touch. The need for such a hybrid strategy makes sense, because there are no perfect automated expert advisors and yet a manual strategy is often hard to handle especially for beginners. sRs Trend Rider gives a solution that enables anyone to start trading, that requires minimal intervention and that includes trader’s decisions into the equation. What pleases me is the amount of testing and proof provided for this Forex trading system. For the launch of sRs Trend Rider, three beta testers are running it on their accounts and live statements are provided. From these statements we can tell more about the strategy. sRs Trend Rider seems to be working with different currency pairs (presumably all major pairs). It doesn’t set a take profit – the exit point is handled by the system itself and it seems to be an average of 29 pips. The average stop loss is about 35 pips. So that makes the award/risk ratio of approximately 1.24. It’s above 1 and ideally we’d like to see it less. The winning rate of 74% doesn’t add to decrease the risk either. However, it’s pretty close. It’s worth to mention that while the above numbers are the average of all three statements provided, one of them has shown a risk/award ratio below 1. While that only adds to my assumption that sRs Trend Rider has a 50/50 chance to be successful in long term in any particular instance, it’s rare to see a system that achieves even that. Also, having in mind the manual trading component in this hybrid strategy, it’s very likely that the human intervention is the key to turning it into a success or failure in the long term. Are you up for a challenge? Although the product description says you don’t have to be in front of your computer , we definitely need to be around close by in the same room , as the only way SRS gives an alert is by an audible “ding”. I think this is a very big drawback. We cant keep sitting all day or all night waiting for an “alert”. I wish it was automated or atleast alerts should be sent by text msg to your cell phone. I guess it is only good for people who are currently jobless and stay at home all the time. I would like to see more feedback on this product. I know the author Vladimir Ribakov, he is well know FX trader and a mentor. I have used his signals before and usually made out nice PIPs when I could not pull the trigger on my own system. Anyone on here been using SRS for a while? Any good and/or bad results? I’m looking to get it and this site is the only one I’ve found w/ honest reviews by real people. I had this. If u really got time to sit in front of your pc and wait for the alert, it will be profitable for you. I tried it but due to the nature of my work, it is impossible. I would suggest to go for the srstrade cloner. This is an EA with some modification. It is a paid montly services. Google it and u can have more details. I have recently bought this system and have used it on three profitable trades. It seems very sound but as per other comments, you have to be near your computer to take a trade but after that the management EA can be left to take over and it seems to work well. I shall use it only when I am working on my laptop, otherwise I shall rely on my other three work alone EAs. Leo Trader Pro, Forex Steam and Signals Machine. Dear Bob Bridges, Leo Trader is a complete waste of time! Yes their promotion only highlights winning trades, however what you need to know is the volume of trades, I hope nobody needs to rely on this product to pay for anything that alone how much was spent on the program, I’ve tried it and it is complete crap! PS, check out CopyPastePips Megatrend, I’m using it with some success, but whatever you do not buy the automated EA! I’m thinking about getting the SRS system. it sounds alot like the Rover North system out there. If any one could let me know how it runs please do so and Thanks in advance. I tried the LTP bot and it seems like a waste of time. even with the win rate. I really think that a system that is worth anything will have a live-real-money track record. Search reviews for this before you buy! Very different from Rover North, which I returned after a month of testing. Very similar to that Child’s Play FX system. I started trading it in a demo account yesterday. It is very easy to use. Profitable after 2 days, lol. Let’s see in 4 weeks. i havent use the system. If you switch your time frame, your are not using a systematic trading aproach and I am sure it will not work in long term in this way. Concerning SRS, it seems to be a moving average. How can we pay for a moving average?!! As I said I dont know exactly what is behind and if it works, but I am really sceptical. I am using the sRs trend rider.Bought it last week.The sRs trend rider is a trade alert software with other features attached to it and is one you must not fully depend on.It can go against any trend.The second hiccup is it takes ages to for it to come with an alert.The third is the gentleman behind these alert is still learning the ropes (Bill). The previous guy(zack) was the forex pro who left on personal reasons. (Family reasons)Realized it later. The pack has its manuals where it will teach you what to lookout for. This alert system will only work in your favour if you follow its guide diligently which you will get in your PDF file. Now regarding the sitting all day and waiting bit(lol),Vladimir has along side this sRs trend rider pack ,another software called the Trade cloner.You pay a subscription fee of 47$ monthly and what it does is it will copy all potential trades right onto your broker chart for you.All on autopilot.It doesn`t end there.Vlad has a recommended broker via his link where if you deposit $2500,it will include VPS. VPS is a service where you can have your forex charts open 24/7, 365 days without the need to log off.You can open your forex account with this broker for as little as 500$ on a live account without the VPS though.Thats all I have for you for now.I hope my review has help in your decision making.Good luck.